High degree of innovation and a modern design. The Alko Highline 42.7P is a powerful mower with a cutting width of 42cm (16″), this mower ensures quick progress when mowing gardens up to 800 m². The cutting height adjustment is carried out on each wheel in 7 stages from 25mm to 75mm. The 2.0 kW AL-KO Pro engines with overhead valves offer a long service life. 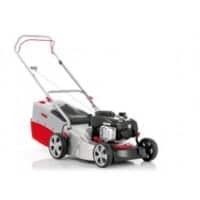 The 3INONE function offers mowing, collecting and mulching of the grass whilst the ergonomically shaped handlebar and XL wheels with ball bearings make lawn mowing a pleasure. The grass clippings pass through the high steel sheet mowing deck to the rear of the 65-litre collector with level indicator, filling it up to the top meaning the grass box needs emptying less frequently.